To see if your tyres have enough tread depth, you just need to take the 20p test. Simply take a 20p coin and place it in the main grooves of your tyre. If you can see the outer band of the 20p coin when it’s placed in the tyre, then the tyres may be dangerous and illegal and should be inspected by a tyre professional. 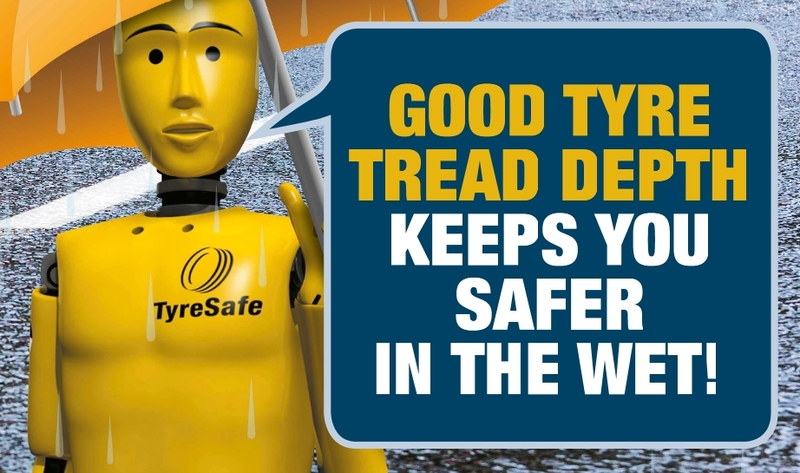 2013 was the wettest winter in the UK on record and in wet weather, it’s essential that your car’s tyres have adequate tread depth. Without it, your safety on the road will be compromised and you may not be able to brake, accelerate or corner properly. Without sufficient tread depth your tyres may not be able to cope properly and you face an increased risk of aquaplaning. If this has ever happened to you, you’ll know what a frightening experience this can be as you have no control of the car. Don’t believe us? Take a look at our dramatic demonstration! Improving your safety in the wet and reducing your aquaplaning risk is simple. You just need to check your tyre’s tread depth regularly and replace your tyres when they are becoming worn. The legal minimum tread depth for cars in the UK is 1.6mm across the central three quarters of the tyre around its entire circumference. Driving on tyres which are below this limit is not only dangerous but illegal and you could face a fine of up to £2,500 and three penalty points for each tyre!